The Vikings return three starters to the lineups on Sunday against the Lions. Running back Dalvin Cook, left tackle Riley Reiff and cornerback Xavier Rhodes are active for 2018’s second NFC North game. All three were listed questionable after being limited in practice this week. A source told the Star Tribune this week that Cook is expected to play only about 15 to 20 snaps against the Lions in his first game since the Sept. 27 loss in Los Angeles. He’s dealt with a lingering hamstring injury suffered in Green Bay on Sept. 16, and the team is trying to ease him back into action. So, expect Latavius Murray to still play a big role. Rhodes went through an extensive pregame workout at U.S. Bank Stadium on what’s listed as a foot injury but head coach Mike Zimmer has described as a sprained ankle. He looked fluid in his lateral and straight movements and will return against the Lions. Reiff returns against his former team after missing the past three games due to a foot injury that has bothered him since the Sept. 22 loss against Buffalo. Rookie Brian O’Neill is expected to remain at right tackle over Rashod Hill. 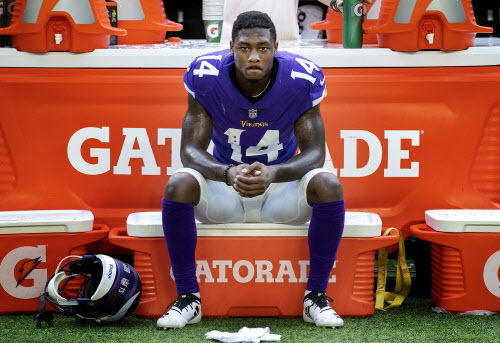 Receiver Stefon Diggs is one of four starters the Vikings won’t have against the Lions. Diggs was listed questionable Friday despite not practicing all week due to a rib injury suffered against the Saints. The Vikings (4-3-1) will also be without linebacker Anthony Barr (hamstring) and guard Tom Compton (knee). Both are missing a second game after injuries suffered in New York on Oct. 21. With Diggs out, rookie receiver Chad Beebe is active for his first NFL game after he was promoted to the 53-man roster on Saturday. Safety Andrew Sendejo will miss his fourth straight game due to a groin injury. Vikings’ inactives: Barr, Sendejo, Compton, Diggs, QB Kyle Sloter, RB Roc Thomas (hamstring) and DE Tashawn Bower. Lions’ inactives: LB Jalen Reeves-Maybin, G Joe Dahl, DE Eric Lee, OL Andrew Donnal, RB Ameer Abdullah, LB Kelvin Sheppard and DE Kerry Hyder.